Last week, I was trying to learn how to develop a Firefox extension. 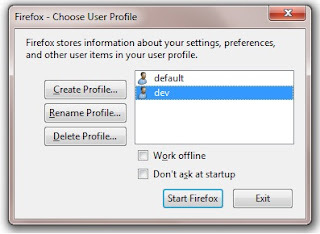 One of the things I discovered, that was useful, was that I could create another Firefox profile and use that specifically for development. So now, I have a "default" profile that I use for my daily work-related stuff and a "dev" profile that I use for researching into developing Firefox add-ons. When I need to, I just launched the appropriate profile to suit my tasks. Today, I wanted to launch two sessions of the Firefox browsers as I needed to log in to two different Gmail accounts (one of my many Gmail accounts is reaching the quota and I needed to transfer some of my emails... LOL). 1. Press the "WINDOWS" key and "R". 2. Type in "firefox -P profile_name -no-remote". 3. Press the "ENTER" key. 4. A "Firefox - Choose User Profile" pop-up will appear. You can create a new profile or use an existing one. Launch as many profiles as you need by following the above steps :-) Btw, I am using Windows 7. So the steps for other Windows versions might be different. Also, if you like, you can create a Windows shortcuts for each profile you created. Cheers.